This article is about movement or gait in horses. For movement of the limbs of terrestrial animals in general, see Gait. Horse gaits are the various ways in which a horse can move, either naturally or as a result of specialized training by humans. Gaits can be roughly categorized into two groups: the "natural" gaits that nearly every horse will use without special training, and the "amble," or the "ambling" gaits, a collection of several other smooth footfall patterns that may appear naturally in some individuals but which usually occur only in certain breeds, and often require special training of the horse before a rider can request them on command. Another classification system, applicable to quadrupeds in general, uses the categories of 1) walking gaits (including ambling), 2) running or trotting gaits, and 3) leaping gaits. The British Horse Society Dressage Rules require competitors to perform 4 variations of the walk, 6 forms of the trot, 5 leaping gaits (all forms of the canter), halt, and rein back but not the gallop. The British Horse Society Equitation examinations also require proficiency in the gallop as distinct from the canter. The so-called "natural" gaits, in increasing order of speed, are the walk, trot, canter, and gallop. Some people count these as three gaits by considering the canter a variation of the gallop, even though the canter is distinguished by having three beats, whereas the gallop has four beats. All four gaits are seen in wild horse populations. 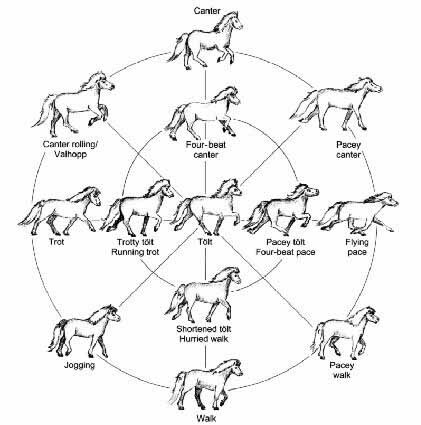 While other intermediate speed gaits may occur naturally to some horses, these four basic gaits occur in nature across almost all horse breeds. In some animals, the trot is completely replaced by the pace or by an ambling gait. More often, horses who possess an ambling gait are also able to trot. The walk is a four-beat gait that averages about Template:Convert/mphTemplate:Convert/test/A. When walking, a horse's legs follow this sequence: left hind leg, left front leg, right hind leg, right front leg, in a regular 1-2-3-4 beat. At the walk, the horse will always have one foot raised and the other three feet on the ground, save for a brief moment when weight is being transferred from one foot to another. A horse moves its head and neck in a slight up and down motion that helps maintain balance. Ideally, the advancing rear hoof oversteps the spot where the previously advancing front hoof touched the ground. The more the rear hoof oversteps, the smoother and more comfortable the walk becomes. Individual horses and different breeds vary in the smoothness of their walk. However, a rider will almost always feel some degree of gentle side-to-side motion in the horse's hips as each hind leg reaches forward. The fastest "walks" with a four-beat footfall pattern are actually the lateral forms of ambling gaits such as the running walk, singlefoot, and similar rapid but smooth intermediate speed gaits. If a horse begins to speed up and lose a regular four-beat cadence to its gait, the horse is no longer walking, but is beginning to either trot or pace. The trot is a two-beat gait that has a wide variation in possible speeds, but averages about Template:Convert/mphTemplate:Convert/test/A. A very slow trot is sometimes referred to as a jog. An extremely fast trot has no special name, but in harness racing, the trot of a Standardbred is faster than the gallop of the average non-racehorse. In this gait, the horse moves its legs in unison in diagonal pairs. From the standpoint of the balance of the horse, this is a very stable gait, and the horse need not make major balancing motions with its head and neck. The trot is the working gait for a horse. Despite what one sees in movies, horses can only canter and gallop for short periods at a time, after which they need time to rest and recover. Horses in good condition can maintain a working trot for hours. The trot is the main way horses travel quickly from one place to the next. Depending on the horse and its speed, a trot can be difficult for a rider to sit because the body of the horse actually drops a bit between beats and bounces up again when the next set of legs strike the ground. Each time another diagonal pair of legs hits the ground, the rider can be jolted upwards out of the saddle and meet the horse with some force on the way back down. Therefore, at most speeds above a jog, especially in English riding disciplines, most riders post to the trot, rising up and down in rhythm with the horse to avoid being jolted. Posting is easy on the horse's back, and once mastered is also easy on the rider. To not be jostled out of the saddle and to not harm the horse by bouncing on its back, riders must learn specific skills in order to sit the trot. Most riders can easily learn to sit a slow jog trot without bouncing. A skilled rider can ride even a powerfully extended trot without bouncing, but to do so requires well-conditioned back and abdominal muscles, and to do so for long periods is tiring for even experienced riders. A fast, uncollected, racing trot, such as that of the harness racing horse, is virtually impossible to sit. Because the trot is such a safe and efficient gait for a horse, learning to ride the trot correctly is an important component in almost all equestrian disciplines. Nonetheless, "gaited" or "ambling" horses that possess smooth 4-beat intermediate gaits that replace or supplement the trot (see "ambling gaits" below), are popular with riders who prefer for various reasons not to have to ride at a trot. Two variations of the trot are specially trained in advanced dressage horses: the Piaffe and the Passage. The Piaffe is essentially created by asking the horse to trot in place, with very little forward motion. The Passage (rhymes with "massage") is an exaggerated slow motion trot. Both require tremendous collection, careful training and considerable physical conditioning for a horse to perform. The canter is a controlled, three-beat gait that usually is a bit faster than the average trot, but slower than the gallop. The average speed of a canter is between 16–27 km/h (10–17 mph), depending on the length of the stride of the horse. Listening to a horse canter, one can usually hear the three beats as though a drum had been struck three times in succession. Then there is a rest, and immediately afterwards the three-beat occurs again. The faster the horse is moving, the longer the suspension time between the three beats. The word is thought to be short for "Canterbury gallop." In the canter, one of the horse's rear legs – the right rear leg, for example – propels the horse forward. During this beat, the horse is supported only on that single leg while the remaining three legs are moving forward. On the next beat the horse catches itself on the left rear and right front legs while the other hind leg is still momentarily on the ground. On the third beat, the horse catches itself on the left front leg while the diagonal pair is momentarily still in contact with the ground. The more extended foreleg is matched by a slightly more extended hind leg on the same side. This is referred to as a "lead". Except in special cases, such as the counter-canter, it is desirable for a horse to lead with its inside legs when on a circle. Therefore, a horse that begins cantering with the right rear leg as described above will have the left front and hind legs each land farther forward. This would be referred to as being on the "left lead". When a rider is added to the horse's natural balance, the question of the lead becomes more important. When riding in an enclosed area such as an arena, the correct lead provides the horse with better balance. The rider typically signals the horse which lead to take when moving from a slower gait into the canter. In addition, when jumping over fences, the rider typically signals the horse to land on the correct lead to approach the next fence or turn. The rider can also request the horse to deliberately take up the wrong lead (counter-canter), a move required in some dressage competitions and routine in polo, which requires a degree of collection and balance in the horse. The switch from one lead to another without breaking gait is called the "flying lead change" or "flying change". This switch is also a feature of dressage and reining schooling and competition. If a horse is leading with one front foot but the opposite hind foot, it produces an awkward rolling movement, called a cross-canter, disunited canter or "cross-firing." The lope is a Western term for the canter. The gallop is very much like the canter, except that it is faster, more ground-covering, and the three-beat canter changes to a four-beat gait. It is the fastest gait of the horse, averaging about Template:Convert/toTemplate:Convert/test/A, and in the wild is used when the animal needs to flee from predators or simply cover short distances quickly. Horses seldom will gallop more than Template:Convert/orTemplate:Convert/test/A before they need to rest, though horses can sustain a moderately-paced gallop for longer distances before they become winded and have to slow down. The gallop is also the gait of the classic race horse. Modern Thoroughbred horse races are seldom longer than Template:Convert/miTemplate:Convert/test/A, though in some countries Arabian horses are sometimes raced as far as Template:Convert/miTemplate:Convert/test/A. The fastest galloping speed is achieved by the American quarter horse, which in a short sprint of a quarter mile (Template:Convert/miTemplate:Convert/test/A) or less has been clocked at speeds approaching Template:Convert/mphTemplate:Convert/test/A. Like a canter, the horse will strike off with its non-leading hind foot; but the second stage of the canter becomes, in the gallop, the second and third stages because the inside hind foot hits the ground a split second before the outside front foot. Then both gaits end with the striking off of the leading leg, followed by a moment of suspension when all four feet are off the ground. A careful listener or observer can tell an extended canter from a gallop by the presence of the fourth beat. Contrary to the old "classic" paintings of running horses, which showed all four legs stretched out in the suspension phase, when the legs are stretched out, at least one foot is still in contact with the ground. When all four feet are off the ground in the suspension phase of the gallop, the legs are bent rather than extended. In 1877, Leland Stanford settled an argument about whether racehorses were ever fully airborne: he paid photographer Eadweard Muybridge to prove it photographically. The resulting photo, the first documented example of high-speed photography, clearly showed the horse airborne. According to Equix, who analyzed the biometrics of racing thoroughbreds, the average racing colt has a stride length of Template:Convert/ftTemplate:Convert/test/A; that of Secretariat, for instance, was Template:Convert/ftTemplate:Convert/test/A, which was probably part of his success. A controlled gallop used to show a horse's ground-covering stride in horse show competition is called a "gallop in hand" or a hand gallop. Note that when a horse jumps over a fence, the legs are stretched out while in the air, and the front legs hit the ground before the hind legs, which is completely different from the suspended phase of a gallop. Essentially, the horse takes the first two steps of a galloping stride on the take-off side of the fence, and the other two steps on the landing side. A horse has to collect its hindquarters after a jump to strike off into the next stride. The pace is a lateral two-beat gait. In the pace, the two legs on the same side of the horse move forward together, unlike the trot, where the two legs diagonally opposite from each other move forward together. In both the pace and the trot, two feet are always off the ground. The trot is much more common, but some horses, particularly in breeds bred for harness racing, naturally prefer to pace. Pacers are also faster than trotters on the average, though horses are raced at both gaits. Among standardbred horses, pacers breed truer than trotters – that is, trotting sires have a higher proportion of pacers among their get than pacing sires do of trotters. A slow pace can be relatively comfortable, as the rider is lightly rocked from side to side. A slightly uneven pace that is somewhat between a pace and an amble, is the sobreandando of the Peruvian Paso. On the other hand, a slow pace is considered undesirable in an Icelandic horse, where it is called a lull or a "piggy-pace". With one exception, a fast pace is uncomfortable for riding and very difficult to sit, because the rider is moved rapidly from side to side. The motion feels somewhat as if the rider is on a camel, another animal that naturally paces. However, a camel is much taller than a horse and so even at relatively fast speeds, a rider can follow the rocking motion of a camel. A pacing horse, being smaller and taking quicker steps, moves from side to side at a rate that becomes difficult for a rider to follow at speed, so though the gait is faster and useful for harness racing, it becomes impractical as a gait for riding at speed over long distances. However, in the case of the Icelandic horse, where the pace is known as the skeið, "flying pace" or flugskeið, it is a smooth and highly valued gait, ridden in short bursts at great speed. A horse that paces and is not used in harness is often taught to perform some form of amble, obtained by lightly unbalancing the horse so the footfalls of the pace break up into a four beat lateral gait that is smoother to ride. A rider cannot properly post to a pacing horse because there is no diagonal gait pattern to follow, though some riders attempt to avoid jostling by rhythmically rising and sitting. There are a significant number of names for various four-beat intermediate gaits. Though these names derive from differences in footfall patterns and speed, historically they were once grouped together and collectively referred to as the "amble." Today, especially in the United States, horses that are able to do an ambling gait are referred to as "gaited." In almost all cases, the primary feature of the ambling gaits is that 3 of the 4 feet are on the ground at any time, reflected in the colloquial term, "singlefoot." All ambling gaits are faster than a walk but usually slower than a canter. They are smoother for a rider than either a trot or a pace and most can be sustained for relatively long periods of time, making them particularly desirable for trail riding and other tasks where a rider must spend long periods of time in the saddle. There are two basic types: lateral, wherein the front and hind feet on the same side move in sequence, and diagonal, where the front and hind feet on opposite sides move in sequence. Ambling gaits are further distinguished by whether the footfall rhythm is isochronous, four equal beats in a 1–2–3–4 rhythm; or a non isochronous 1–2, 3–4 rhythm created by a slight pause between the groundstrike of the forefoot of one side to the rear of the other. Not all horses can perform an ambling gait. However, many breeds can be trained to produce them, and there are several breeds of horses who inherit the ability to perform these gaits either naturally from birth or with a minimal amount of training. The fox trot is most often associated with the Missouri Foxtrotter breed, but is also seen under different names in other gaited breeds. The fox trot is a four-beat diagonal gait in which the front foot of the diagonal pair lands before the hind. The same footfall pattern is characteristic of the trocha, pasitrote and marcha batida seen in various South American breeds. Many South American horse breeds have a range of smooth intermediate lateral ambling gaits. The Paso Fino's speed variations are called (from slowest to fastest) the paso fino, paso corto, and paso largo. The Peruvian Paso's lateral gaits are known as the paso llano and sobreandando. The lateral gait of the Mangalarga Marchador is called the marcha picada. The rack or racking is a lateral gait most commonly associated with the Five-Gaited American Saddlebred. In the rack, the speed is increased to be approximately that of the pace, but it is a four-beat gait with equal intervals between each beat. The running walk, a four-beat lateral gait with footfalls in the same sequence as the regular walk, but characterized by greater speed and smoothness. It is a distinctive natural gait of the Tennessee Walking Horse. The slow gait is a general term for various lateral gaits that follow the same general lateral footfall pattern, but the rhythm and collection of the movements are different. Terms for various slow gaits include the stepping pace and singlefoot. The Tölt is a gait that is often described as being unique to the Icelandic Horse. The footfall pattern is the same as for the rack, but the tölt is characterized by more freedom and liquidity of movement. Some breeds of horses that are related to the Icelandic horse, living in the Faroe Islands and Norway, also tölt. The revaal or ravaal is a four-beat lateral gait associated with Marwari, Kathiawari or Sindhi horse breeds of India. ↑ "Junior Equitation and Horse Welfare 2A requires riders to 'be able to develop a hand gallop from a canter and return smoothly to canter'"
↑ "Junior Equitation and Horse Welfare 3A requires riders to 'maintain a balanced and secure position at walk, trot (sitting and rising), canter and gallop, showing the rider is progressing along the right lines.'" ↑ Lieberman, Bobbie. "Easy-Gaited Horses." Equus, issue 359, August, 2007, pp. 47–51.